If you are looking for Houston window installation, you are most likely replacing one or all of your home’s windows, or even building a new home. No matter what type of project you’re taking on, you need to make sure you’re getting the highest quality windows out there without breaking the bank. That’s why it’s important to choose the right Houston window installers—ones who know the ins and outs of window installation and who will help you find the best options for your project. If you need window installation in Houston, you’re in the right place. Houston Window Experts is certified in window installation for Milgard Windows and Doors, as well as many other high-quality brands. Our experts have years of experience installing windows in the Houston area, bringing functionality, energy-efficiency, and style to Texas homes. No matter the type of home you live in, the professional window installers at Houston Window Experts will ensure that your replacement windows match your aesthetic, style, and budget. But before you begin the window installation process, it is important that you know the basics—and that you know what type of window installation works best for your home. Read on to learn more about your options when it comes to Houston window installation. How many times have you felt a draft in your home? Do you often avoid going around the windows during the winter because the draft is so intense that it leaves you feeling chilled and uncomfortable? You may not even realize it—but you might have a draft around your home that has been there for some time. In addition to this unbearable chill in your home during extremely cold months, your home might also feel sweltering during extremely hot months. If you haven’t already guessed, poorly installed windows are the culprit. If your windows are not installed correctly, you might spend far more on your energy bills than necessary. If you are unsure if your windows are installed properly, a contractor or window specialist can help you determine the necessary steps to keep your energy bills down. A professional Houston window installer will seal your windows to prevent temperature loss. Sealing the windows will help to eliminate the drafts from your home and allow your heating system to operate more efficiently. If you find that your windows are not properly installed, it’s time to pursue a window installation project. How many times have you looked at your heating bill and wondered what you could do to help reduce the amount of money you are spending every month? As a homeowner, you are probably searching for ways to help improve upon your current home and make it as comfortable and affordable as possible. And chances are, your current windows are not up to par. Most of the time, energy bills are quite costly because hot or cool air is escaping through windows that have not been properly sealed. Not only will replacement window installation help to save you money, but it will also ensure your home is nice and toasty throughout the chilly winter months, and cool and breezy during the hot Houston summers. Sometimes the problem with window installation may be that you have the wrong window for your home. Larger homes—which already face high utility bills—may be more energy-efficient when they are able to retain more heat during the winter, or keep harmful UV rays and heat out during the summer. In addition to having properly installed windows, making the decision to invest in more energy-efficient windows may help increase the savings on your utilities bill. With professional Houston window installation, your home can be equipped with new doors and windows that prevent temperature loss and keep your bills down. And you will be able to reap the benefits in the form of saving on your energy bills when you hire a window installation expert to improve your home. Saving money on utilities and energy costs is one of the major benefits of new window installation. But cheaper utility bills are not the only benefit. Not only will you save money on your energy costs, but you will also reap the rewards of an increased home value if you decide to sell your current home. If you decide to sell your home in the future, buyers will be sure to feel more comfortable making an offer when they know that your home is energy-efficient, well-insulated, and comfortable. When it comes to your home, you want to ensure you are saving as much money as you possibly can. Something as simple as your windows can mean the difference between saving hundreds per year and throwing it all away. Don’t let your finances suffer for a simple repair—ensure the job is done correctly the first time around by utilizing the services of a trusted Houston window installation expert. Each of these brands offers high-quality windows that are available in choices that will fit any requirement that you have in replacement windows—including casement, bay or bow windows, and sliding windows. If you want to improve the value of your home, these brands are the perfect choice for you. There are many reasons to replace the windows and doors in your home. You could be repairing damages or simply giving your home a little facelift. Either way, if you are looking for replacement windows or doors, it’s a good idea to choose ones that work best for your home. There are many different types of homes that are popular throughout America. Some of these types of houses originated on the west coast, east coast, or even the midwest—but have since become popular all across the country. Find your type of house below to see which doors and windows you should choose. Craftsman Houses: Craftsman homes are known for their stone-covered exteriors and big porches. This style of home was particularly popular in the late 19th to early 20th century. Because these homes are so beautiful and historical, many people are trying to restore and maintain them. Classic or Colonial Houses: With large porches, shutters, and wood detailing, classic or colonial homes are warm and inviting. They are a modernization of colonial-style houses, which were popular in America’s early years. Ranch Houses: Ranch homes were particularly popular in the west and southwest, including in Houston. However, this style of home has spread throughout the country, especially during the 1960s. These houses are often single-story. Farmhouses: Farmhouses were originally used on, well, farms. This style of home originated in the midwest, but is now used throughout the country. Farmhouses are known for simple 19th century design with large porches, narrow windows, and wood sidings. Modern Houses: Modern homes became particularly popular in the 1950s and 60s, but have had an increase in popularity the last few years. They often have clean lines, flat or forward-sloping roofs, and wide horizontal windows. Proper installation of replacement windows in Houston is essential. You can have the best windows money can buy, but if not installed correctly, they will be practically useless. There are a few areas in which mistakes cannot be made, such as measurements, ordering, and the actual installation. One misstep can be costly and even dangerous. Step 1: Measuring accurately. Accurate measurement is one of the first points that must be precise. Even the slightest miscalculation can create gaps or leaks in your windows. This not only will allow for unwanted airflow into the house, but will also cause leaks, which can damage your home’s structure. Not only must the replacement windows fit tightly, but the siding or outside material must also provide an air- and water-tight seal. Poorly fitting windows will affect the appearance of the home as well. Step 2: Ordering replacement windows. The next installation point that must be precise is in the ordering. When choosing replacement windows, many homeowners invest a lot of time in making sure they have picked the perfect unit. They have poured over brochure after brochure, carefully selecting the exact window and options they need. If the associate taking the window order misses one aspect, the windows will not be right. If the error is not a big deal, the homeowners may opt to live with it. But if new replacements have to be ordered, this will cost time and money. Step 3: Installing replacement windows. Finally comes the installation. If the windows are not properly placed, this will create all kinds of problems. The durability of the windows may be compromised, as well as the home’s structure. Inaccurate installation can also seriously affect or even void the warranty. How awful would it be to find out that your windows were not put in correctly, and now not only do you have to fix the problem, but your warranty will not cover it? The replacement windows must be plumbed and squared. Shims may be necessary to make everything level. Even the screw placement is important. The units must be properly sealed and caulked to ensure a tight fit. Step 4: Ensuring installation accuracy. Accuracy is not just a good idea for window installation companies, but is also essential if companies want to stay in business. Failure to properly install a replacement window can cause damage, operation issues, and even potential safety hazards. If a window will not open properly, it could be a fire hazard. This could have devastating results. Homeowners are best served finding a quality installation company for their window replacement needs in Houston. When builders look to purchase new replacement windows, finding a product that serves the purpose and keeps the bottom line in tact is essential. At Houston Window Experts, we offer windows of many different materials. No matter your window installation project, we can help you find energy-efficient, budget-friendly window solutions for your home. Increased comfort and energy-efficiency are two of the benefits of vinyl windows. While builders won’t necessarily be the direct recipients of these advantages, they do appeal to buyers, making the home easier to sell. Windows that deliver lower utility bills and year-round comfort are attractive factors for potential homeowners to consider. Vinyl windows typically have great options available to improve their efficiency as well. Builders are also best served finding windows that are low maintenance and can stand up to extreme weather conditions. Vinyl is fade-resistant, durable, and can be cleaned with just a little soap and water a couple times a year. Made of polyvinyl chloride (PVC), vinyl windows can endure the most severe precipitation and wind. Longevity is another huge benefit of this great material. Knowing that you have installed windows that will serve future residents well for many years to come is extremely satisfying. When you are in the business of building and selling homes, finding products that appeal to buyers is very important. You don’t make money when you can’t sell the houses you have built. New vinyl window installation is one of the most popular choices among homeowners. Not only do vinyl windows provide long-lasting comfort and efficiency, they are very affordable. Therefore, you owe it to yourself to have these great products installed at your sites. Known for their impressive strength and durability, thermal aluminum windows are a great option for houses and commercial buildings with large windows. Thermal aluminum windows are made of thin, strong glass that has a very modern, sleek look. The glass is very sturdy and resistant to scratches, marks, and dings. Aluminum window frames can also be painted and customized to a specific building or home. But while thermal aluminum windows are very durable and strong, they are also very energy-efficient. A feature called a thermal break contributes to the energy-efficiency of aluminum windows. A thermal break is a gap between two panes of glass, separating the outside metal from the inside window frame. This means that your home or building stays warm in the winter and cool in the summer. Homeowners often choose thermal aluminum windows for their window installation projects because they are energy-efficient and affordable. At Houston Window Experts, we will help you find thermal aluminum windows that match the windows currently in your home, and we will even provide you with all-new options if you are replacing every window. We offer many high-quality thermal aluminum window brands, including windows from the Don Young Window Company. Talk to a professional at Houston Window Experts today to find the perfect thermal aluminum windows for your home. Out of the many types of installation windows we offer, fiberglass is one of the most popular and most reliable. Their strength and durability is very similar to that of vinyl windows, and both are made of materials that make them impervious to termites and carpenter ants. However, fiberglass windows are slightly more durable than vinyl windows, and can be as much as nine times stronger, often lasting years longer. Another plus of fiberglass replacement windows is that they require little maintenance besides painting, if you choose to do so. Because the material in fiberglass is sourced from glass, these windows will not warp. Fiberglass windows are also very energy-efficient and can help you reduce your energy bills over time. At Houston Window Experts, we offer many superior brands of fiberglass windows for your Houston window installation project. 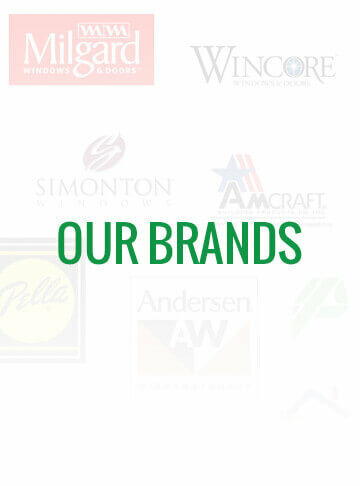 One of the brands we often recommend is Milgard Ultra Fiberglass Windows, which are both affordable and high-quality. Talk to a window installer at Houston Window Experts to see which brand of fiberglass windows will be the right fit for your home. Wood windows have been used in homes and buildings for centuries, and for good reason. Wood windows are great at insulating your home, making sure that warm air stays in during the winter, and stays out during the summer. In many cases, wood windows are better at insulating your home than vinyl and fiberglass windows. Another great feature of wood windows is their life expectancy. If maintained properly, wood windows can last for a very long time. If you take the care to repair cracks and prevent spreading, your wood windows may never have to be replaced, or at least will not need to be replaced for years to come. Wood windows are popular not just because they are energy-efficient and long-lasting, but also because of how beautiful they are. Wood windows bring a classic, rustic look to any home, and are very common in historical houses. This is one reason why homeowners choose wood windows for their window installation project—their classic home already has beautiful wood windows, and they want to keep that same aesthetic. No matter what window material you choose to go with, the professional window installers at Houston Window Experts can help you find the best option for your home or building. With our extensive list of name-brand windows and years of expertise, Houston Window Experts is the right choice for your window installation project. Is it time for some new windows in your Houston home? Are you considering a new window installation project? With so many window installation companies in the Houston area, finding the perfect people for your window installation project can seem overwhelming. If you are looking for a company that you can trust for replacement windows in Houston, call the professionals at Houston Window Experts. Houston Window Experts is a company run by the Ludy family, in business in the Houston area for the past 12 years. We pride ourselves on our attention to detail and commitment to satisfying our customers. Our family has been installing quality windows in the Houston area for many years now, helping many customers improve the look, energy-efficiency, and functionality of their homes. Honesty, integrity, and a commitment to doing things the right way for our customers is the main reason why we continue to be one of the most sought-after companies in the Houston area when it comes to window installation. Houston Window Experts has a great selection of window products for your installation project. We love our builders and look forward to forming relationships with all of the companies in the area. We not only deliver our fabulous products directly to the job site, but we also offer installation services. We have some of the best installers in the industry. So, for your new window needs, choose Houston Window Experts. Make the call today and have your replacement windows installed by the company that cares. Call Houston Window Experts and enjoy a free consultation—and the beautiful view provided by your new windows. This entry was posted in Window Project Portfolio. Bookmark the permalink. Are Milgard Windows Affordable Options for Houston Replacement Window?